By the deep sea, and music is its roar. And made my home in the foothills of South Mountain. To see things that I alone must see. We talk and laugh and forget about going home. To establish ourselves amid perfect emptiness in a single flash is the essence of wisdom. The photo, taken by my daughter Ilona, is of the toxic iron/aluminum mix constantly flowing out of an abandoned coal mine at Snow Fork, Ohio. Snow Fork is the most heavily polluted stream in the Monday Creek watershed. A look at what it takes to clean it up is at this pdf [link] . When the company moves on to---uhhh, greener pastures and meadows, it seems as if the taxpayer gets handed the bill for cleanup and care for displaced workers. I don't know who thinks this is such a great system. I know there's nobody cheerfully cleaning up any mess I may leave out from day to day. But then, I guess I don't provide wages to people for jobs that create my mess. I guess that must be the secret of success and wealth. I suppose there are some companies that clean up the mess, and maybe even do it out of gratitude to a community that provided workers---rather than for a tax incentive. But the coal companies didn't in Appalachia, and the people left behind, many lured from homes elsewhere, sometimes struggle for generations to get back on their feet. That people eventually drink the water from Snow Fork is a testament to what can be done---but it's costly. In other areas where coal was king around where I live, people are turning their legacies into historical projects. At New Straitsville, there's a cave where disgruntled workers huddled to form a union, and the United Mineworkers was born. Now there's a park and museum at the beautiful site. Inside you can learn about a misguided job action that purposely set a fire in the mine 125 years ago, and it's still burning today. Up the road apiece at Shawnee, a place that once was a boom town is rebuilding. Grants are needed and slowly they are gathering. The architecture at Shawnee is unique and amazing, but the town is very poor and first the people need to become inspired. An astonishing theater at Shawnee is being restored, but it takes years and hundreds of thousands of dollars to do something like that. If it gets done it will be a showplace for the whole region. The owners run a giftshop across the street, and you should stop by. These are a couple of the towns of a ravaged area becoming known as the Little Cities of the Forest...or of the Black Diamonds. Chunks of coal used to be called black diamonds when they were the main fuel of US industrialization. Since the State ended up with a lot of the land, Ohio has established state forests these past 70 years for recreation and hiking. The museums and restorations are coming along as people regain the pride they have for these towns, many of them built by the companies but now Home for 3 generations. THROUGHOUT PENNSYLVANIA, THE VFW HALLS look much the same — a bar stretches across the front and a bingo parlor sits behind it. In 1995, T. Allan Comp, a historic preservationist who specializes in industrial sites, walked into the VFW bar in the small borough of Vintondale. Comp was looking for some local people who had agreed to talk with him about a reclamation project that he called Acid Mine Drainage and Art (AMD&ART). Comp’s idea was to reclaim toxic former coal mines using not only science but elements of design, sculpture, and history, which he hoped would spur community involvement and create vital public spaces. And although a small group had gathered in the bingo hall to meet with Comp, the men sitting at the bar had their doubts. “One of the guys said, ‘Are you here for that art thing?’” Comp told me when I met him in 2005. He explained to the men that what he really wanted to do was transform the wasted area that ran alongside the community into a new kind of park. A ripple of laughter ran down the bar. “They were like, ‘Har, har, har. That’s got to be the dumbest idea in the world,’” said Comp. Five years later, after a lot of public meetings and public planning, Comp took a picture of a group of men building benches in front of the firehouse, benches that would eventually sit in the park. “What’s great about that photo is that three of the men in it had been at the bar that first night,” Comp told me on the day that the AMD&ART Vintondale Park was officially dedicated. We were actually sitting at one of those benches inside a large pavilion. It was a beautiful summer day. Speeches had been made and supporters had been thanked. To our right, a series of passive treatment ponds was transforming an orange, acidic syrup into clear, clean water that flowed into a seven-acre wetland before emptying into Blacklick Creek. To our left, children were playing on the new soccer field while their mothers watched and talked in the pavilion’s shade. Visitors took guided tours of the ponds, gardens, and sculptural installations dedicated to the memory of the men who dug coal in this small community until the 1950s. When the underground mines shut down and the coal companies skipped town, they left behind a poisonous discharge of sulfuric acid and iron known as acid mine drainage. 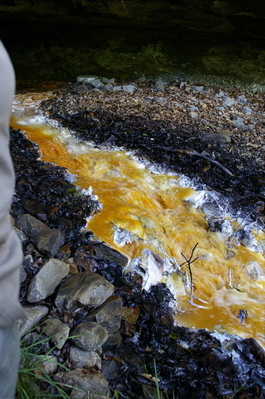 So many Pennsylvania streams run orange with acid that, according to Comp, “People from the region don’t even see it. They grew up with it.” Comp himself grew up in Southern California and came to Pennsylvania in 1993 to work for the National Park Service’s National Heritage Areas Program, where he oversaw economic development, education, and historical preservation in a ten-county region. He had earned his PhD in the history of technology and American economic history from the University of Delaware. But two years of teaching at Boston University convinced Comp that his future lay beyond the ivory tower. “I wanted to be out in the field, working with all of this history,” he said. So he moved to the National Park Service to become senior historian of the Historic American Engineering Record, documenting historical industrial sites for the Library of Congress. In the late 1990s, the Environmental Protection Agency designated acid mine drainage as the biggest environmental problem in the eastern mountains. But well before then, Comp had been kicking around the idea of a reclamation project that would actually call attention to the problem and its solution. “If we’re going to get our act together enough to address a big environmental problem,” Comp said, “we ought to celebrate the fact that we’ve gotten our act together enough to address a big environmental problem.” Ten years after that first meeting in the bingo hall, Comp and Vintondale had indeed brought off something remarkable: together, and assisted by a dedicated crew of AmeriCorps and VISTA volunteers, they transformed the town dump into what the AMD&ART mission statement calls “a public place in which to explore, learn, reflect, and recreate.” And they have learned a lot about themselves and each other. THE AIM OF AMD&ART, “to re-create a sense of place by honoring the past and instilling hope in the future,” is certainly laudable. But Comp’s first encounter at the VFW hall is suggestive of the forces that work against such initiatives in the coal fields of Appalachia. In the 1910s, the railroad found its way into the remote hollows of these mountains. Company towns, or coal camps, were thrown up quickly, and all manner of men — immigrants and mountaineers — went to work underground. Families from twenty-two countries came to Vintondale, looking to earn a living. The work was brutal and the pay poor. A man might spend all day loosening coal in a twenty-inch-high mine shaft and earn one dollar. A miner’s wife-turned-songwriter, Sarah Ogan Gunning, remembered, “It literally happened—people starved to death. Not only my baby, but the neighbors’ babies. You see them starve to death too. And all you could do was go over and help wash and dress ’em and lay ’em out and sit with the mothers until they could put ’em away.” Eventually, the miners tried to organize. Throughout Appalachia, the bloody union wars of the 1930s dramatized exactly what kind of civic engagement the coal companies would not tolerate. “If you were civically engaged in a coal camp, “ noted Comp, “you were likely to get fired, blacklisted, and be homeless.” So the tendency to keep one’s mouth shut, to grudgingly accept terms set by others, became part of the Appalachian character. According to Comp, it has led to the “nothing good happens in Vintondale” attitude that he met up with that first night at the VFW hall. Looking at old photos of the AMD&ART site, one can understand why. When the coal operators pulled out of Vintondale, they left behind thousands of tons of “bony,” coal waste that has very little energy value. Mounds of this black rubble were strewn around crumbling coke ovens and rusting coal tipples. The coal operators also left behind a dwindling community where the per capita income was half of the state average. As Comp writes in his AMD&ART founder’s statement, “These are citizens who rarely, if ever, have the opportunity to participate and learn from any kind of cultural or arts-related activities within their own town. There is little sense of being special in Vintondale, no particular distinction to boast of, only constant decline for half a century—typical for much of Coal Country, too typical.” In 1998, as a survey of townspeople showed, the idea that this thirty-five-acre blight could be a place that attracted tourists and brought pride to the town sounded, if not like “the dumbest idea in the world,” certainly like a remote possibility. Undeterred, Comp put together a core team of designers that included hydrologist Bob Deason, sculptor Stacy Levy, and landscape designer Julie Bargmann. And crucial members of his elaborate cast were the townspeople themselves. “If I have an art form, it’s probably choreography,” Comp explained, “and I don’t even get to pick the dancers. I’ve got elephants and gazelles and they all have to work together.” At one of the first town meetings, Comp handed out topographical maps of the site, along with markers, and he asked the people of Vintondale, including some high school kids he had rounded up on a street corner, to draw in what they wanted. As it turned out, what the community wanted and what the AMD&ART team envisioned were not exactly the same thing. The design team talked about a water-treatment system, wetlands, and public art; the community talked about picnic tables and a baseball field to replace the one lost in a 1977 flood. Comp takes obvious pride in the fact that everyone — designers and townspeople — got most of what they wanted. “No one is allowed to compromise, but all have to accommodate” is a kind of mantra for Comp when it comes to designing with and for communities. He is emphatic in his belief that good design must include public engagement. “Designers who work in the isolation of their offices when doing community projects are designing in a vacuum,” he maintains. Sue Thering, from the University of Wisconsin, Madison, has spent a great deal of time studying the Vintondale project. Thering is an extension agent in the Department of Landscape Architecture, and her work focuses on encouraging citizen participation in public works. She believes that the design team’s receptiveness was the key to earning the community’s trust and changing much of its defeatist attitude. The same survey that was conducted in 1998 was replicated in 2001. In those three years, the number of residents who thought positive change—attracting tourists or bringing fish back to the creek, for example—was possible jumped from 20 percent to 70 percent. Thering attributes the shift to what adult education theorists call transformative learning. “The people in Vintondale were being listened to and they were learning to bump up against their own preconceptions about themselves and about the community,” she told me at the park’s dedication, over a couple of kielbasa. “Something changed that made them think it was possible to build a park that people would visit.” That something was a dialogue between what Thering terms “outside experts” from the design team and “inside experts,” the people in Vintondale who knew their town’s history best. And in 1995, the EPA’s Sustainable Development Program awarded AMD&ART a $250,000 grant. That was enough to begin work on a passive treatment system that would naturally convert acid mine drainage back to swimmable water. Though Deason engineered this system, Comp emphasizes that all four members of the design team collaborated on every component of the park. They designed six keystone-shaped ponds at the eastern edge of the property. A half mile away, acid mine drainage was pouring out of a mine portal into Blacklick Creek at a rate of two hundred gallons per minute. Today, that drainage is pumped into the first treatment pond where, instead of taking the typical approach of using sodium hydroxide to neutralize the acid, Deason lined the pond bottom with limestone that naturally draws iron out of the water. The discharge then flows downhill into the other ponds, growing cleaner with each filter process, until it is ready to return to the creek. On one weekend in 2001, AMD&ART organized the planting of a thousand trees beside the ponds. The idea was to create a “litmus garden” where the fall color of the trees would reflect the color of the acidic water as it turned from a reddish-orange, to yellow, to silver green. One hundred and fifty people showed up that day to help, including many Vintondale natives who had moved away. Alongside the first pond, they planted six-foot-tall black cherry and sweetgum trees whose leaves would turn red in the fall. Downstream they planted orange-leafed sugar maple, yellow-leafed poplar and hackberry, and finally the light-green black willow to indicate clear, uncontaminated water. ONE OF THE STRANGER THINGS ABOUT ALLAN COMP is whom he works for now: the U.S. Department of the Interior — in particular, the Office of Surface Mining (OSM). Within the environmental and conservation community, OSM is usually not considered a forward-thinking regulatory agency, particularly under the current administration. When George W. Bush first took office in 2001, he loaded most federal natural resources agencies with undersecretaries who had previously worked as lobbyists for the very industries they were being entrusted to regulate. None of this is news to Comp. He knows he’s the odd man out at OSM. But in 1999, when Gene Kruger, OSM’s division chief for reclamation assistance, saw what was happening at Vintondale, he asked Comp to organize something similar for OSM. “OSM wanted me to come in and do this in a lot of other places,” Comp said. He now oversees the Watershed Assistance Team, which places VISTA workers in communities across Appalachia. In 2004, Comp won the Department of Interior’s Environmental Achievement Award for creating innovative partnerships between OSM and various organizations working to protect watersheds. In the current political climate, one learns to savor small victories. In reality, Comp works “so far down inside the belly of the beast” that he poses little threat to industry — at least that’s what he said as he and I sat in his favorite diner in Cambria City. About fifteen miles from Vintondale and right across from the steel mills, this was the community where immigrants had settled in the 1930s. Reasoning that he was also an immigrant to Pennsylvania, Comp bought a small house here back in the 1990s so he could be close to Vintondale. The diner is a neighborhood fixture where the waitresses are extremely nice and breakfast is ridiculously cheap. After we ate, Comp took me for a tour of the newly completed AMD&ART Park. We walked along the Ghost Town Rail Trail, which today attracts seventy-five thousand bicyclists a year, and was one of the main things that attracted Comp to the abandoned mine site. A few cyclists had stopped at a low concrete platform to watch artist Jessica Liddell add the last porcelain tiles to a mosaic that illustrates what these thirty-five acres looked like at the height of the coal boom. The nine-by-fifteen-foot mosaic is modeled on a 1928 Sanborn Insurance map. It depicts with a line of brown and black tiles the coke ovens whose foundations are still visible in the wetland area beyond the mosaic. Across the Ghost Town trail from Liddell’s piece stands Mine Portal No. 6, where in the 1930s and 1940s most of the men of Vintondale disappeared underground each morning. From the trail, you can see that a large slab of polished black granite now blocks the portal, framed with heavy timbers. Much like the Vietnam Veterans Memorial Wall in Washington DC, it does not look that impressive from a distance. Only when stepping closer do you realize that an image of nine miners leaving the portal has been diamond-etched into the granite. The miners all carry lunch pails and wear head lanterns and heavy work coats. The artist, Anita Lucero, etched them life-sized and in exquisite detail. But unlike the Vietnam Memorial, where only the names of the soldiers appear, the Miner’s Memorial depicts images that were taken from the quarter-inch, 8-millimeter film of a 1938 home movie. Comp enlarged the image to eight-by-ten inches and chose Lucero to re-create this tableau. Over a hundred people attended the dedication of the Miner’s Memorial in 2005. Comp recalled, “We had guys showing this to their grandkids, saying, ‘That’s the kind of lunch bucket I had. My lunch was in the top, my water was in the bottom.’ As a historian, that’s important to me.” And unlike the Vietnam Memorial, where the names are cut deep into the granite to accentuate that they will not be forgotten, the image of these miners appears gauzy and almost ghostlike. That was Comp’s intention, and Lucero’s rendering is as evocative as it is accurate. And yet, through the ritual of art, these ghost miners have made the history of Vintondale real again. The social theorist Michael Mayerfeld Bell has written thoughtfully about what he calls “the ghosts of place,” defining ghosts as “felt presences” or “the sense of the presence of those who are not physically there.” In Vintondale, that dormant sense of being of a place—so characteristic of Appalachia—has been revived through a work of public art that retrieved the past in order to celebrate it. And by laying claim to the past, a community has laid claim to a revived sense of place. Perhaps the clearest example of this in Vintondale is that its residents have recently decided to restart, after thirty years of inactivity, the Town Planning Commission. Comp and I circled the treatment ponds and the Litmus Garden until we came to one of my favorite aspects of the AMD&ART Park design. It is a slate installation, set on the bank of Blacklick Creek, directly across the park from the Miner’s Memorial. Called Clean Slate, it was designed by University of Pennsylvania landscape architecture students Claire Fullman and Emily Nye. It is a minimalist work made up of two long pieces of rough black slate, placed in the form of a stair step. The lower slab is set right beneath the mouth of a culvert where water from the treatment ponds, having passed through a wetland area, finally empties into the creek. Visitors are encouraged to stand on that platform and let the purified water wash over their bare feet. Anyone who is inspired to do so can leave chalk messages on the higher, dry piece of slate. There are plans to plant ferns and other plants around this stark work, vegetation that dates back to the Carboniferous Age—the age of coal. STILL, FOR ALL OF THE PARK’S OBVIOUS VIRTUES, the cynic’s question hangs in the air: Is it art? Not in any traditional representational sense. Rather, the origins of a landscape such as the AMD&ART Park are in the conceptual art movement of the 1960s and 1970s—a movement that took art off the canvas, and often out of the museum, so that it became an experience in place and time, rather than simply a painting on a wall. Whatever conceptual art was, it wasn’t decor. Its practitioners believed that such projects could, as Rose Lee Goldberg writes, “effectively transform people’s everyday lives.” Joseph Beuys, one of the conceptual movement’s luminaries, submitted 7000 Oaks to the Documenta 7 exhibit of 1982. It was a plan to reforest Kassel, Germany, symbolized by one spade that leaned against a white wall. Each patron paid to sponsor a tree, and in return received from the artist a signed certificate proclaiming, “Small oak trees grow and life continues.” To understand the world as a canvas is to think very differently about its composition and one’s place within that composition. And to think “of the entire world as art,” as greenmuseum.org director Sam Bower suggests, means to begin thinking seriously about ecological problems and their solutions. Sam Bower’s online environmental showcase has featured AMD&ART prominently, and he gave a short talk at the park’s dedication ceremony. “As the twenty-first century unfolds,” he said, “we urgently need a more constructive relationship between our species and the natural world. We can no longer afford the vacationer’s emphasis on art for art’s sake. The new catchphrase may actually be, Art has a job to do.” To that end, Bower describes tractors and backhoes as the sculptural tools that brought this thirty-five-acre canvas into being. For years, Allan Comp has been describing the Vintondale project as “art that works.” The AMD&ART Park “works” in the sense that it filters acid mine drainage from millions of gallons of water. But it works in a much more subtle way as well—in the way the people of Vintondale experience and respond to it as art. Sue Thering describes Vintondale as a blue-collar town where “people work hard to put food on the table for their families and they don’t have time for art, thank you very much.” However, she believes it was the artistic components of the park that brought locals — especially the men — around. As she sees it, most people don’t get too excited about the science of water purification. But the older men of Vintondale were inspired to show their grandchildren what they looked like, back in the 1940s, walking out of Mine Portal No. 6. Moreover, one of the most important elements of Vintondale may not be its water-treatment system or its sculptural installations, but rather its function as a potential model for many other such projects across the country. “AMD&ART is now both the name of a park in Vintondale and the name of an idea, a commitment to interdisciplinary work in the service of community aspirations to fix the environment,” Comp said. Since the completion of the park, Comp has established the Appalachian Coal Country Watershed Team, a group of fifty-five OSM and VISTA volunteers who are working with the AMD&ART model to engage coal field communities in projects that will remediate damaged waterways and rekindle the power of place. There's a photograph there to illustrate the article, and some nice comments. There's also a column of ways you can get involved in such restoration if you're interested. I've written an artical The bee and the Industial Revolution. If you want a copy email me. I want to thank you for revealing the truth about what the corporations did to the miners and their families. The opening lines of your article is excellent, as was the article, and lyrical. From the contents of your artical I found that you are a man of wisdom and integrity. 5 Feb 2008 @ 09:21 by vaxen : bee? Heh, I thought he was confusing you. jazzolog, with Baron Berez! Oi! Special Counsel Patrick Fitzgerald is in possession of filmed evidence allegedly showing Senator Hillary Clinton entering Bank Crozier in the British territory of Grenada during early 2003 for the purpose of withdrawing stolen and laundered U.S. Treasury funds for alleged personal use after presenting the bank with CIA code numbers in her capacity as a U.S. senator, CIA operative and wife of a former president, according to a team of intelligence sources. One source requesting anonymity told us that “competing teams” of fired intelligence agents and military, federal whistleblowers and patriotic government operatives committed to restoring the U.S. Constitution established private teams “to follow and track Senator Clinton for years” in an effort to validate the intelligence operative’s crimes with the kind of evidence presented to Mr. Fitzgerald. Of course this is only one, and a minor one, of the multi-tiered creep shows which concerns more than just the Clinton Bush Cabal and is having international implications. Back to the dog and pony show with, ah, Obama Diebolded into the lead? Hahahahah (Actually Guffaw^9). Billary and the Slaughterhouse Five.